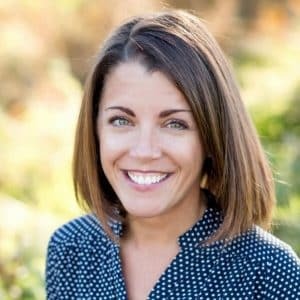 As a homeschooling mom to three little learners, I am constantly searching for educational and fun learning opportunities. I am a huge fan of stealth learning. Rather than adhering to lesson plans day in and day out, I love to strew educational books, games, and other resources. I love to watch learning unfold naturally. We dive down rabbit holes and have fun in the process. 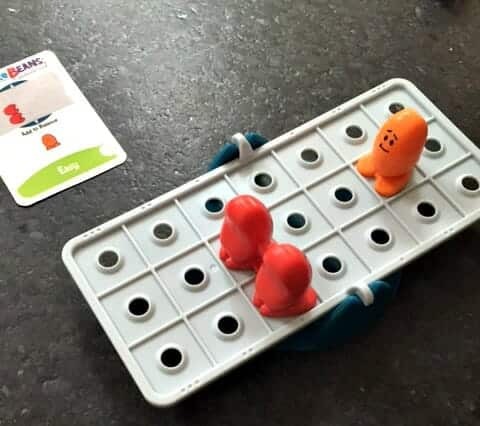 One of my favorite strategies for stealth learning is to use games, and today I’m sharing the newest addition to our game closet: ThinkFun’s Balance Beans. *Disclosure: I received Balance Beans at no cost in exchange for a review. I was not required to write a positive review and, as always, all thoughts and opinions are my own. I only share resources that I would use with my own family, and those that I believe other families will enjoy. Our family has been a fan of ThinkFun’s for many years! 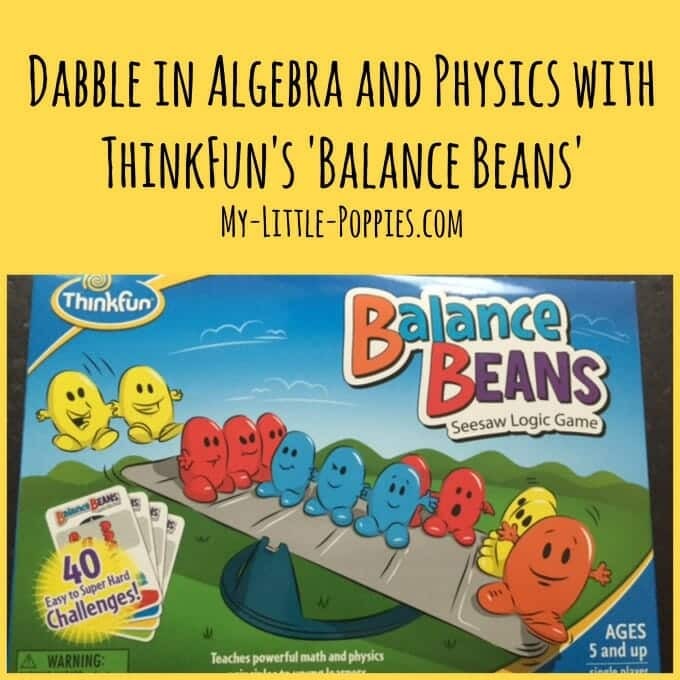 Balance Beans is a new logic and reasoning game from the fine folks at ThinkFun. Balance Beans is a one-player game for ages 5 and up. The game teaches young children early algebra and physics. This little guy is LOVING ThinkFun’s new Balance Beans! I’m loving that he is learning how to balance equations! There are 40 challenge cards included, with four levels of play: easy, medium, hard, and super hard. Balance Beans is easy to play but challenging to master. Young players start off using trial-and-error but even the youngest players get the hang of it quickly. Soon, players learn to use reasoning and problem-solving skills. As they play, they are learning to balance equations and the rules of physics! Balance Beans can be played right out of the box. Rules are simple. Even the youngest game lovers can start playing right away. I love one-player logic games. As a homeschooling mom with three young children, I need a little quiet time. One way I achieve this quiet time without feeling guilty is through high-quality educational games like this one. 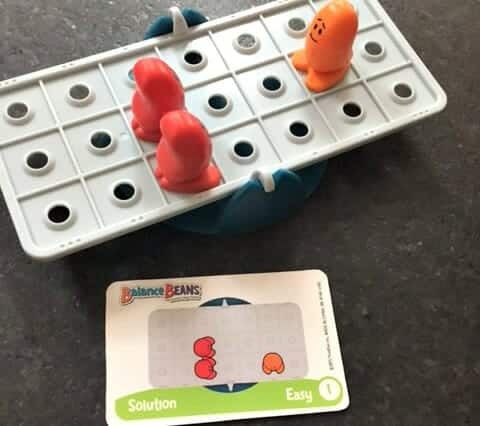 Balance Beans looks like a seesaw to the unsuspecting child but, in reality, children are learning a little algebra and physics! This is stealth learning at its best! I love that some challenges have more than one answer. I think it is important for children to learn that there is often more than one way to solve a problem. Balance Beans comes with an easy-to-carry pouch making it the perfect travel game. We packed it on our most recent vacation! 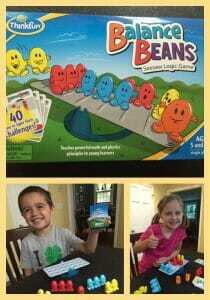 My kids LOVE Balance Beans! They have been playing nonstop since it arrived on our doorstep. In fact, they packed it on our recent vacation because they just couldn’t part with it! The other day, they made Balance Beans into a multiple-player game by taking turns and timing themselves to add more of a challenge. Do you want to add Balance Beans to your game closet? Balance Beans retails at $17.99 and is available at Target, Amazon, Barnes and Noble, and specialty toy stores nationwide. Are you a fan of stealth learning, too? Now, it’s your turn. Tell me: What is your family’s favorite one-player game? Share here!